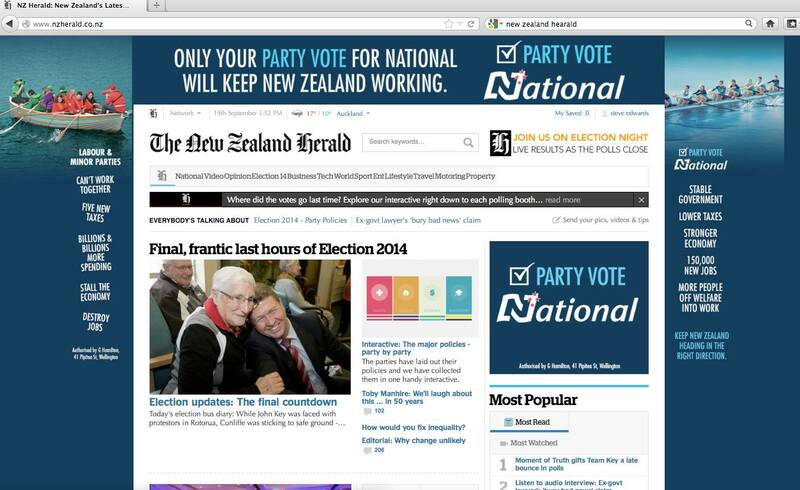 Tapping into the Party Line: A prominent talkback radio listener detected a subtle right-wing tone at work in The New Zealand Herald‘s advertising. An Auckland man was charged with theft and impersonating a sister of Christ at an unholy hour this morning after he stole blue and white livery from St Mary’s Convent in Ponsonby, Auckland, New Zealand Police say. The man, dressed as a nun, was seen by police on Auckland’s Queen Street early this morning showing a small crowd of bemused drunken youths the website of The New Zealand Herald on his laptop. The man, who was granted name suppression because he is a ‘prominent talkback radio listener’, told police that he stole a “nun’s get-up so that he could read The New Zealand Herald in the correct tone,” said Constable Sam I. Amaman. According to the constable, the man had an epiphany (a deep realization) that New Zealand’s national daily newspaper was covertly right-wing in its “political pitch”. 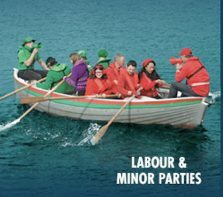 It depicted a scene of disorganized ‘left-wing’ political parties in a dinghy going nowhere, while on the right of screen, the National Party was depicted as a team of athletic rowers in a streamline canoe. “He told me with a straight face, ‘the Herald made me do it’. I thought I had heard everything,” said Constable Amaman. 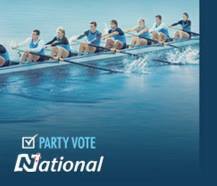 Checking-in: Neo-liberal Team Blue wants the Herald‘s readers to think New Zealand won’t work without them at the helm. When we woke the Electoral Commission’s lawyer Emily Snobhouse at 2 a.m. for comment, she snarled that the Electoral Finance Act says, “nothing about political parties using advertising that stretches credulity out to its theoretical limits”. Unco Lefties: The Nat’s cast the Neo-liberal Left Team as a hopeless boat going nowhere. Blue Team Go-Getters: The Neo-liberal Team Blue cast themselves as a athletic crews of winning canoe racers. In response to my faux jaw-dropped horror face, Constable Amaman said, “Now there’s a conspiracy theory if ever I heard one”, as he ate a mince pie he had just bought from one of the big-four oil cartel’s 24-hour petrol stations. I informed the constable that dog whistling is a public relations industry tactic to amplify peoples’ fears, frustrations, or prejudices, and transform them into anger, as investigative journalist Nicky Hager reported in his book: The Hollow Men: A Study in the Politics of Deception. Amaman’s face became frightened, as though he feared I was going to make him read it, in keeping with the social norm that New Zealanders famously flail and writhe at the prospect of being made to read non-fiction books that are not about sport, cooking, travel, or gardening. 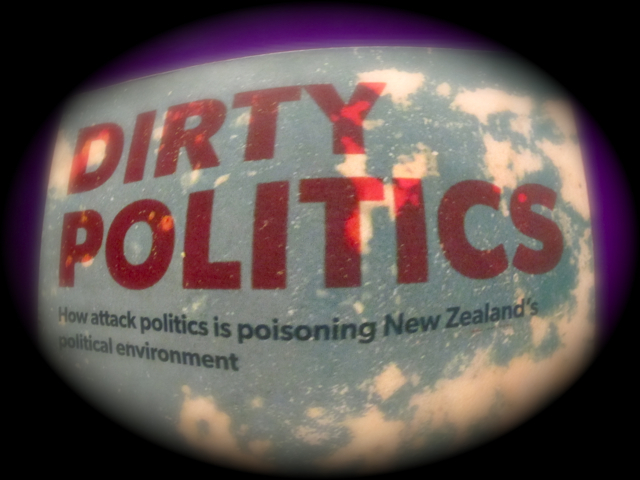 A Tale of Two Prime Ministers: Journalist Nicky Hager’s book revealed John Key’s ‘Mr Nice Guy’ persona was used to keep National’s popularity high, while key people engaged in dirty politics attacks to send the political left into disarray and turn left-leaning voters away from the polls. The ‘prominent talkback radio listener’ stole the nun’s livery yesterday afternoon after seeing brazen National advertising on the Herald’s website. He told police he narrowly escaped “being eaten alive” by Dobermans that guard the convent. Evidently, the commotion woke the Sisters of Mercy nuns who were napping in hammocks. It turns out the charge of impersonating a sister of Christ is an old one dating back to the 19th Century when astute Maori frequently mocked missionaries in New Zealand for advancing the cause of the British Empire and its private political system, capitalism, as was recorded in a are volume, called Freemasonry in the Antipodes: A Study of Masonic Power Upon New Zealand from Captain James Cook’s Circumnavigation of Heathen Savage-Inhabited Lands to the Erection of John Logan Campbell’s Obelisk (1869-1945). This Victorian era law is still on the books. With that the head nun closed the door, the lights went out around the courtyard and the Dobermans began to snarl. As I walked at a steady pace away from the Holy, teethy canines, I had an epiphany that asking the masses to pray for peace is a form a dog-whistling too. Essentially, it is saying that humans in far-flung places are victims unworthy of active action, and that they only deserve the passive action of praying because they are usually brown, black or yellow-skinned peoples following heretical religions, or they are heathen Marxist socialists and communists, hoarding resources that God put there to test the faithful’s gullible resolve. The pious are conned into feeling that they are doing something helpful without realizing they have been indoctrinated to feel powerless by the papal monarchy’s clique and underlings. Meanwhile, the news missionaries from the mass media corporate cartels have the masses believing that the NATO powers have no choice but to bomb the world into freedom. I looked at the snarly Holy canines and commanded them, “Pray for peace. Praaay”. The Dobermans knelt on their front knees and bowed their heads. I turned and made my way briskly through the blue and white pearly gates to the ‘free market’ outside before the dozen canines could finish their neo-liberal dog-prayers and attack another unworthy victim of the ‘free-market’ Shock Doctrine.